Q: What is Paint Protection Film and why do I need it? A: Paint protection film, or “clear bra” as it is sometimes known, is one of the best ways to preserve the showroom quality finish on your vehicle. 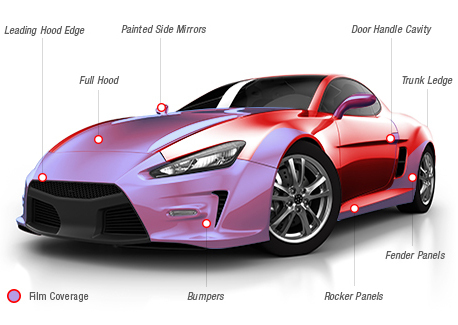 The tough, durable, virtually invisible urethane film will keep your vehicle looking newer longer without changing the design features or color, by creating a barrier and protecting vulnerable areas such as front bumpers, hoods, side mirrors, door handle cavities, door edges, rocker panels, and rear fender panels. Preserving the finish of your vehicle with paint protection film (PPF) keeps your vehicle looking newer longer and can enhance the resale value of your vehicle in the future. Q: How does Scotchgard Paint Protection Film Pro Series compare to other paint protection films on the market today? A: Scotchgard™ Pro Series construction provides many features, advantages, and benefits over other films. In addition, when you buy film from 3M you know you are buying a recognized brand from a trusted company with staying power. Exceptional clarity: Scotchgard Pro Series has low orange peel, making it one of the clearest films in the industry and virtually invisible on the vehicle. Self-healing properties: Innovative technology allows minor scratches to disappear by themselves, keeping the film and your vehicle finish looking new. Excellent durability: The new formula for the Scotchgard Pro Series has superior resistance to yellowing and cracking, ensuring that your vehicle finish retains the showroom quality, color, and design features. Maintenance-Free: Scotchgard Pro Series film does not require any special maintenance to keep it looking great. You can wash and wax your car as you would normally. Q: Where can I put Paint Protection Film on my vehicle? Q: Can I install Scotchgard Pro Series film myself? A: 3M strongly recommends that Scotchgard film be installed by a 3M Certified Installer. They have the training and experience to make sure you receive an installation that is fit perfectly to your vehicle. In addition, the warranty is valid only if the film is installed by a Certified Installer. Q: What is the warranty for Scotchgard Paint Protection Film Pro Series? A: Our comprehensive warranty for Scotchgard Pro Series film is 10 years from the date of purchase and includes coverage against defects, yellowing, bubbling, and cracking. For the full warranty card, please click here. Q: What is the pricing for the new Scotchgard Pro Series film? A: Pricing varies depending upon the area covered on your vehicle and your local market. Visit our locator to find a 3M Certified Installer in your area for a free quote. Q: Is Scotchgard Pro Series Film removable? A: Yes. The film is intended to be permanent, but can be removed without damage to the finish. 3M recommends that you visit a 3M Certified Installer to have the film removed properly. Q: Where can I buy Scotchgard Pro Series Film? A: The film can be purchased and installed by one of our 3M Certified Installers. You can locate an installer in your area by visiting our locator to find a 3M Certified Installer. Q. What if I cannot find a Certified Installer in my area? A: Please call 1-866-PPF-5659 and we can help arrange an installation for you. Q: Where can I get technical information about the Scotchgard Pro Series Film? A: Please review our Technical Data Sheet for more information.